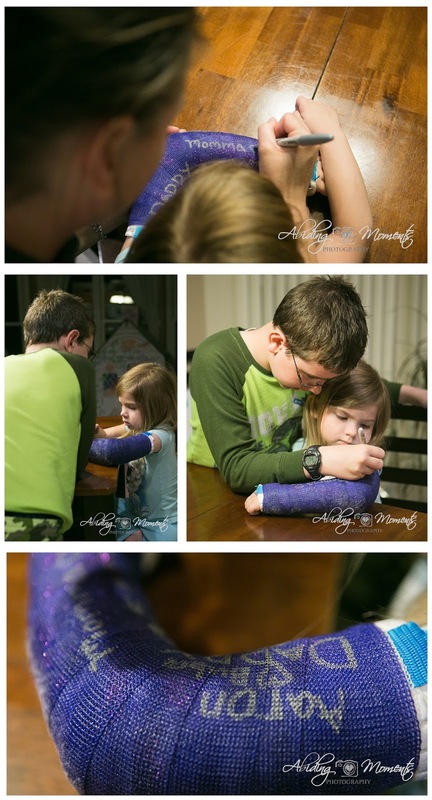 It's crazy to me that I can have one child who has never had a broken bone (knock on wood), and another child, who in the course of 13 months, has fractured the same arm twice by simply running and falling, and ended up in a cast both times. I am unsure if that means that our girl is more clumsy, or simply moves at a faster pace, but whatever it is, it means we know more about "that" cry than I care to. It's never good to have that sinking feeling that your child is hurt. You want to believe that you (or they) are over reacting, but inside, you are pretty sure that's just not the case. I had held and rocked our girl for 30 minutes after her fall, trying to decide if the long day of walking and lack of nap at 8:30 at night was the culprit or not. But after still hearing cries with slight movements, I was pretty sure there was something up. Thank God for comfort items like her blankie and her little stuffed panda. Those things bring a different comfort than I ever knew they would. That and a frozen bags of peas were our saving grace. About 30 seconds in, those peas went on and stayed until the hospital replaced them with a permanent ice bag. My camera, on the other hand, ended up in the hospital because it hadn't made it in the house after our long day - and I wasn't about to leave it in the parking lot. The wait to find out if something is wrong or not felt like trying to collect a jar of maple syrup. Or at least what I would envision it to be. Good thing hospital rooms have televisions and cable. But within about an hour or so, we found out that indeed we had a fracture #2. Same arm as last year, just on the inside this time. 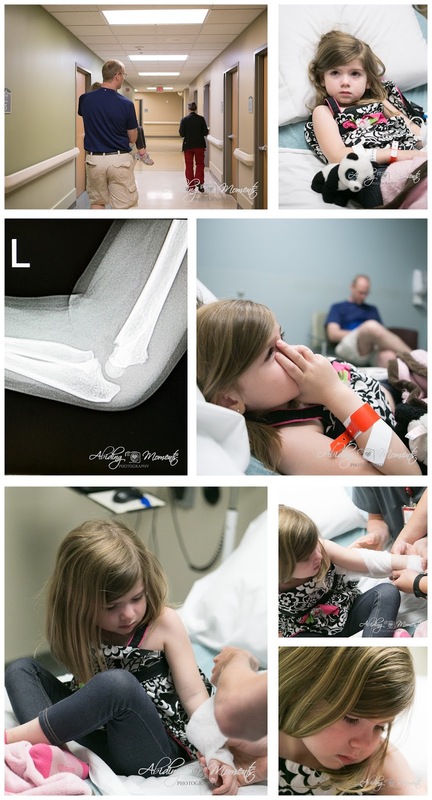 We were able to get a splint and sling this time to get us through the weekend until we could get to an orthopedist. With a friend who works in the ER, we not only got a personal recommendation on a doctor, but also a familiar face when our girl went to replace her splint with a real cast. We adore Who! 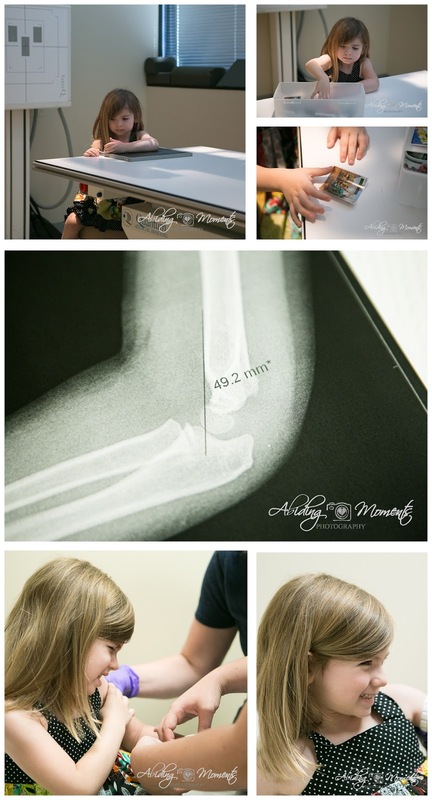 Why I was surprised to see that large bump on the backside of my girl's arm, I am not quite sure, but that was sign number 17 that we definitely had an issue on our hands. And still the wincing and tears when she was turned the wrong way. Thank goodness for toys that came along to keep my people occupied, friends that play along, and doctors who know how to make your kid smile. Then off to get a second x-ray. This is the 4th time our girl has done an x-ray, but none of the other times was I able to take pictures. This time though, without needing me for support, they preferred that I was out of the room, and I was happy to finally get this part for our books. We got the double nurse treatment to help make things go quickly, which meant that I had to get out of the way and watch. 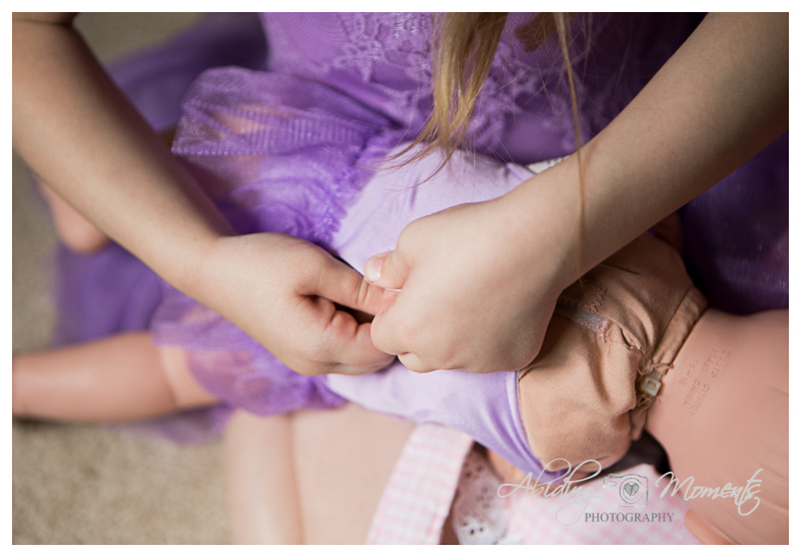 Once our girl asked for a purple cast, those nurses matched up purple gloves with purple scissors and we had the royal treatment. Along with that royal treatment came purple sparkles - and then a purple sucker. I mean, when that staff found out that purple was our girl's color, they were all in. Once home, this time was different because our girl decided that she was ok with getting signatures! 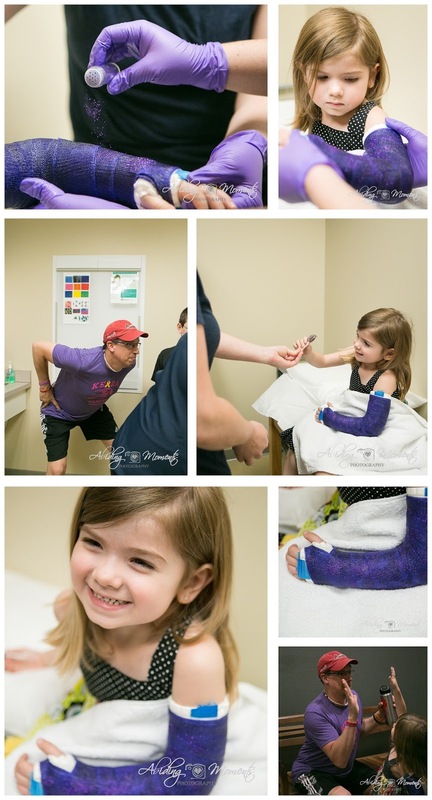 It was fun to watch her be the first to sign her own cast and then give directions to each of us about where we could sign. So, having a fractured arm obviously isn't all bad. You have friends to support you, get to choose your cast color, add glitter, and get candy and a sticker. Plus, it's like you're famous for a day and everyone wants to sign your cast, so that's a highlight, right? Right! But, I am glad that it's only on 4 weeks because a 4 yr old with a cast in the summer is ... well ... not awesome. My son has been a part of the Scouting program since he was in second grade. 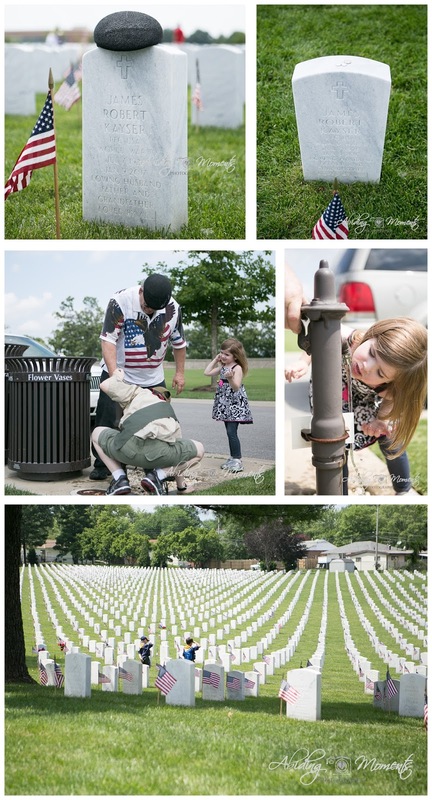 And while he has had lots of great opportunities come his way, decorating at our city's national cemetery on Memorial Day is one he hasn't gotten to officially be a part of. So, this year, when that opportunity came, we made sure to get on the list! I loved getting to be a part of it and seeing everything up close and personal. It was a beautiful tribute to our service men and women that have gone ahead. Especially this year, with the loss of two WWII Vets in our family, both my husband's and my grandfather, in the last 6 months. It was neat to see everything from the very beginning. There are literally thousands of people that participate in this event. Councils gather from our bi-state region and everyone from the little guys to the big guys come out to give a hand for this sacred tradition. In the waiting though, the giggles and wiggles have to be gotten out. We spent quite some time waiting to take our trek in. 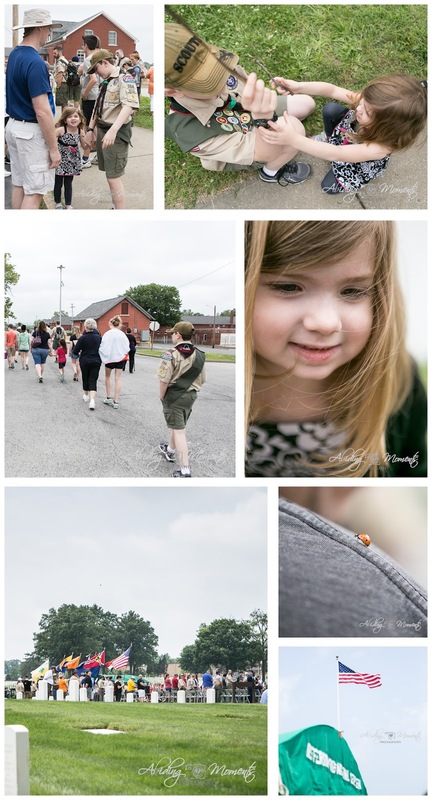 We even had a ladybug friend spend time with us as we walked (and walked) our journey. When we finally arrived, we were able to join all of our groups together for a talk about the importance of our job on this day. 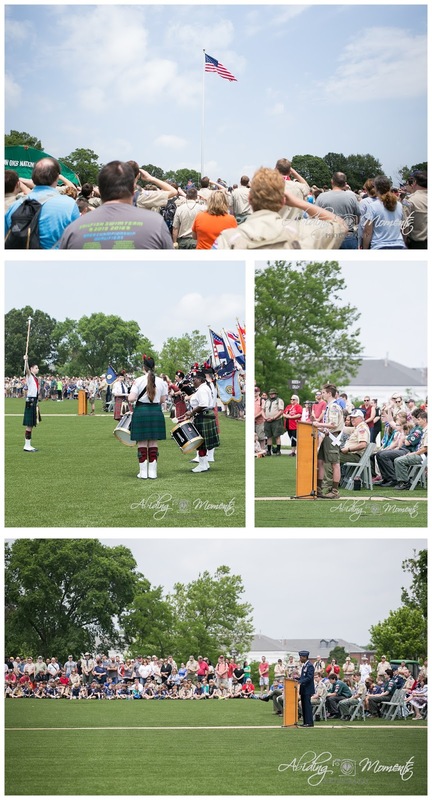 It was inspiring to hear our speaker, Brigadier General Randall Reed, call out the name of one local Scout to recognize, only to be told that while he was present, he would not be able to come forward, as he was buried at Jefferson Barracks. It was certainly a moment to remind you that each headstone is personal and has a story. Afterwards, the flag was lowered to half staff, and with assignments in hand, groups began to head to their designated area. 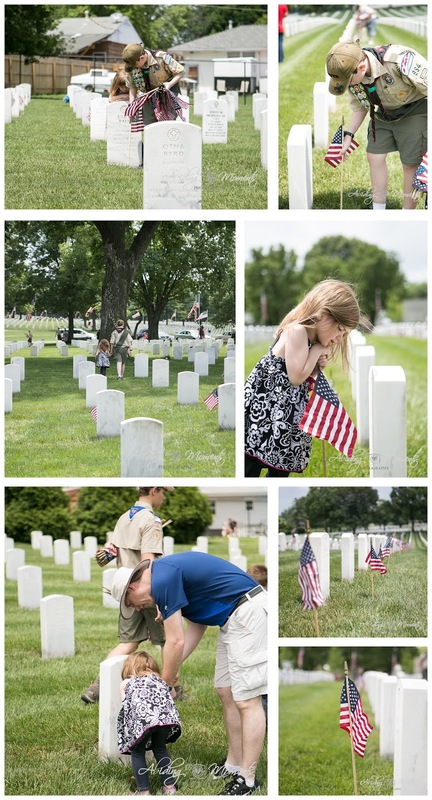 Due to the massive amount of Scouts of all ages, and their various family members, the thousands of graves to be decorated at Jefferson Barracks take less than an hour. Even though it is a quick task, it is an amazing one none the less. I loved watching my children work together and my family get to be a small piece of the big puzzle. Once we were finished, we headed over to visit my husband's grandfather's grave. This is the first time we have all been there together, and it was a beautiful reminder as to the reason we participate in an activity like this. The kids got a quick drink to cool off from all the walking and heat, and we headed out. 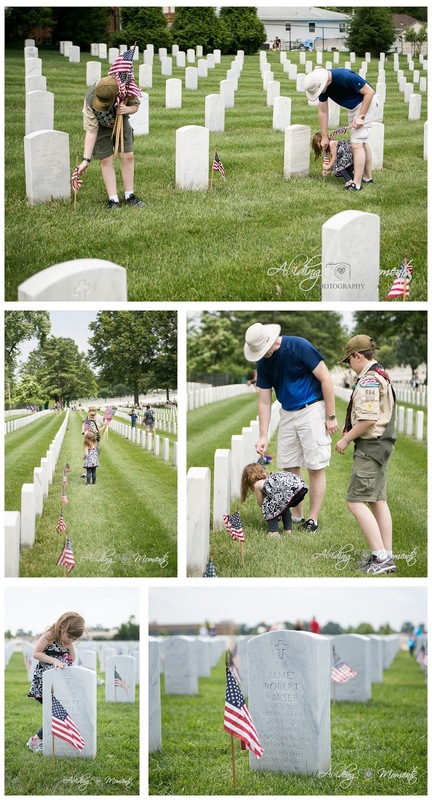 I loved this final shot as we drove out of the cemetery and that two sweet little Cub Scouts knew to salute those that had served for them. It was only once we were on the other side of the tree, that I saw a parent poised to photograph them. 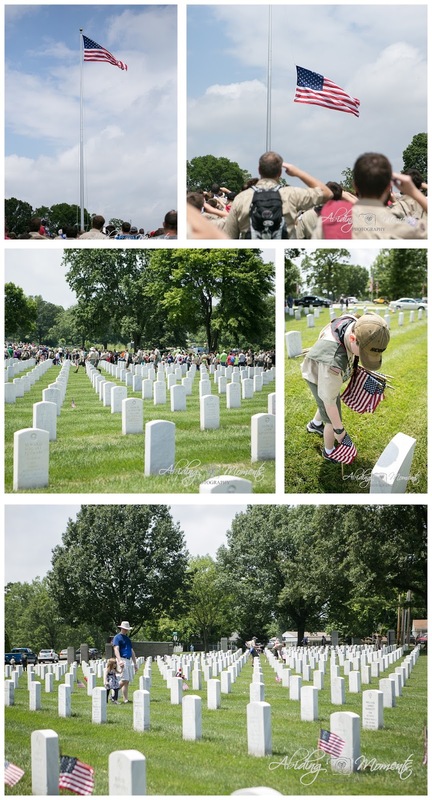 Nonetheless, I loved that they were being taught to put their respect into action on a day dedicated to remembering the service members that have gone ahead of us. Maybe it's just me and my girl, but it seems like when the summer sun begins to give off its heat, the first thing we want to do is run out and soak it up. Never mind that in a few short weeks we will be so tired and over the sun and the extreme heat that we will hide in our basement. In that first beautiful beginning, it is glorious and welcomed and we play and bask for days. A few weeks ago, that's just what happened with our girl. The sun was shining and the blooms were out, stretching to the sun for new growth. 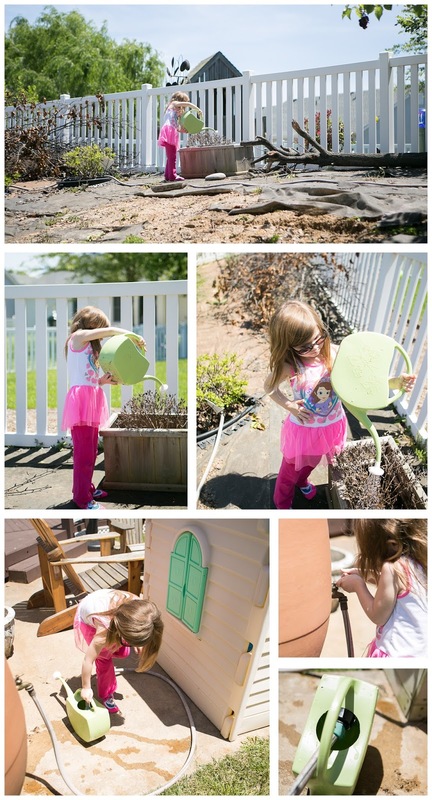 So what's a 4 year old to do but want to help those little plants along? Now, we are not gardeners, so before you proceed, you should definitely throw out whatever idea you have of a beautiful and full garden. 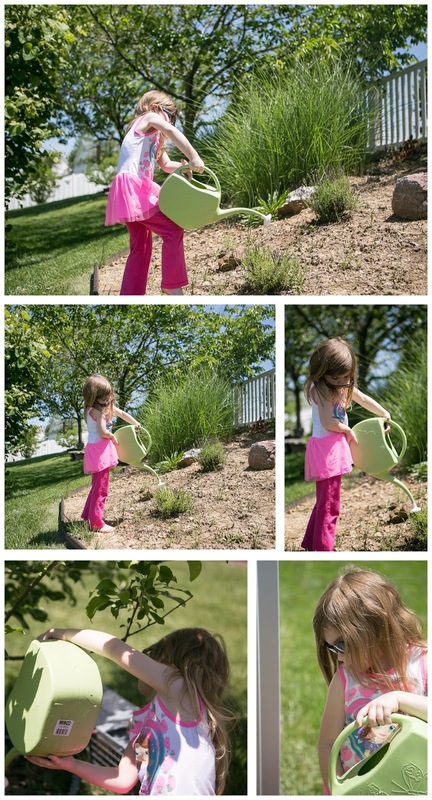 Instead, you should remember that watering is sometimes just fun - and that good stories will ensue when I tell our daughter about how she used to love to water the plants in our yard. It's comical I know, but at least I warned you. Those flowers, by the way, are mums, and let's just say that they will likely have to be purchased again this year, despite our girl's tender loving care. I love to watch her gather the water. 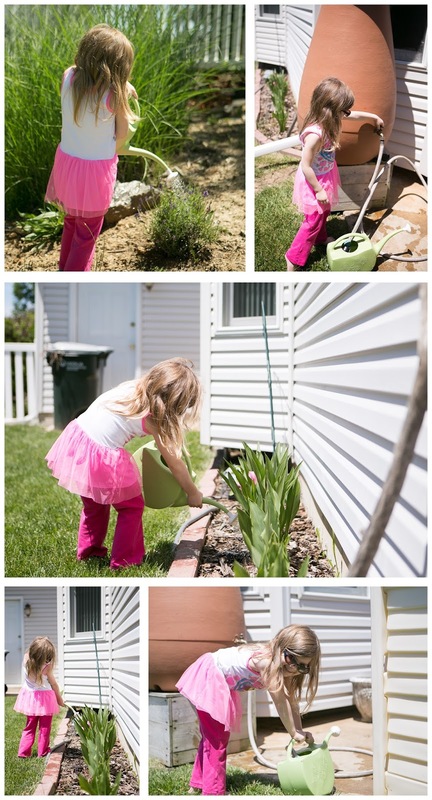 A few years ago, I got a 50 gallon rain barrel, which is PERFECT for allowing our girl to play with the water and not be overly concerned about waste. Those middle ones are my favorite flowers, calla lilies, and God has allowed them to take root and multiply in that spot. Every year, they come back in full force with more friends. I have done nothing and always love how beautiful they look. And finally, my new lavender plants. They haven't yet taken root the way I envisioned. After all, this photographer's dream is a lavender field in her own backyard, but they are definitely larger than last year, so that's a step in the right direction! Plus, with my girl watering them with such strength, they are sure to grow in no time! What a hoot. That girl of ours sure does keep us smiling. 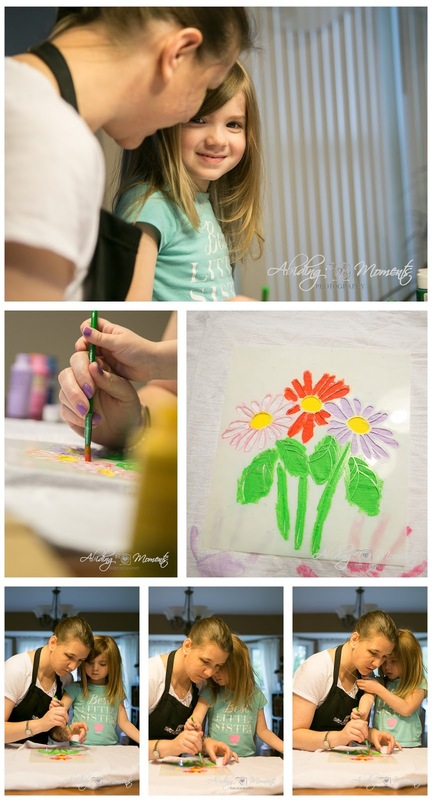 I can't wait to see what her efforts bring - and the excitement she shares over it all. Being a photographer is sometimes a struggle for me. I desperately want to hold on to my memories of my people - but along with that, I want my people to be able to hold on to memories of me. It's typical that I am missing in my pictures. I am an empty spot in the memories. Sometimes it makes me sad to think about how often I was present, but how rarely I am in the pictures. In this case though, I had to be present in the story, so I set my camera settings, re-explained some important details like focus, and added in a new one of perspective, then handed off my camera to my son. The story you see below is what resulted (with editing and direction from me while he shot). This project was a trial run for my MOPS Mommas. I had a vision in my mind of what I hoped would work for an end of the year gift, but I needed to practice one to make sure it would work. When you need a guinea pig as a teacher, your child is typically a great one, and I really wanted to remember this time with my girl. 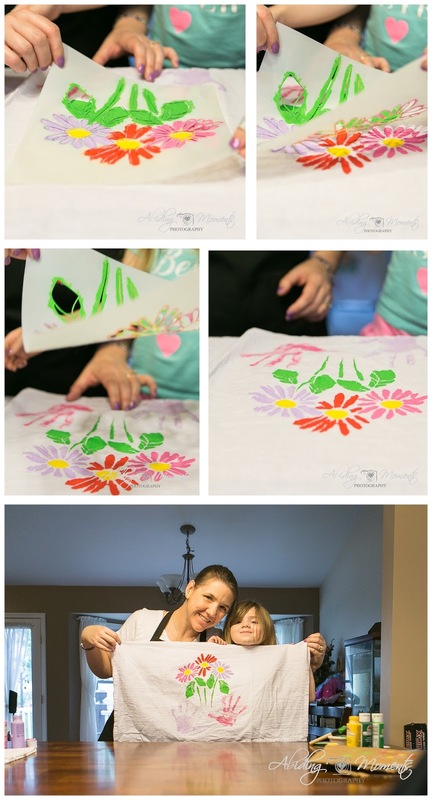 She loves crafting so much and begged to be a part of this project before I even had the chance to ask. When I talked with my son about using different perspectives before we began, I made sure to mention that he would not only want to shoot from different places, but also shoot the details that tell important parts to the story, just like a writer does. I love that he got our hands working together and a silly shot of my daughter. He did a wonderful job here with catching progression too. My daughter frequently curls into my neck and plays with my necklace. I loved that he caught that. And below, that he was able to catch the story of the final lift to show the finished project. I think that sometimes when you see the finished beauty of a styled shoot or event, you tend to forget all the hard, HARD work that goes on behind the scenes to make something like that look - well, beautiful. To watch people seamlessly step into their role for any event to come together is both an expected and surprising occasion. There were literally over a dozen creatives that made this event shine. 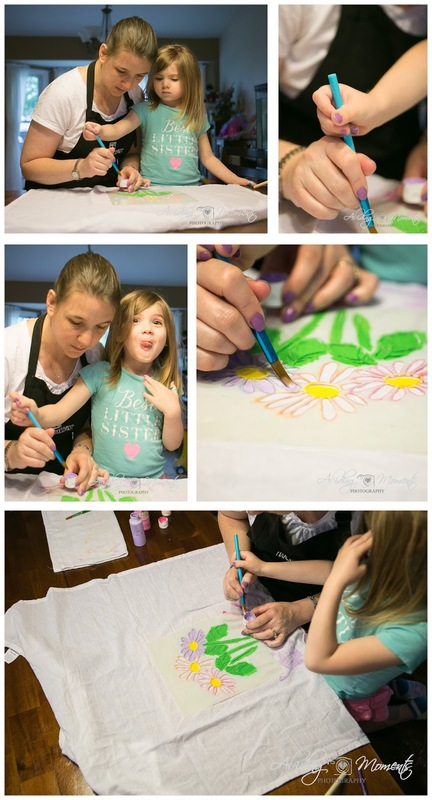 To lay the groundwork, our amazing co-leaders at St. Louis Rising Tide Society, Abby Willtrout and Beth Marmino, planted the seed within our group and began to get to work. Event stylist Vanessa Meagher came along side and began pulling together important pieces for the day. These ladies worked tirelessly before many of us even stepped onto the scene. 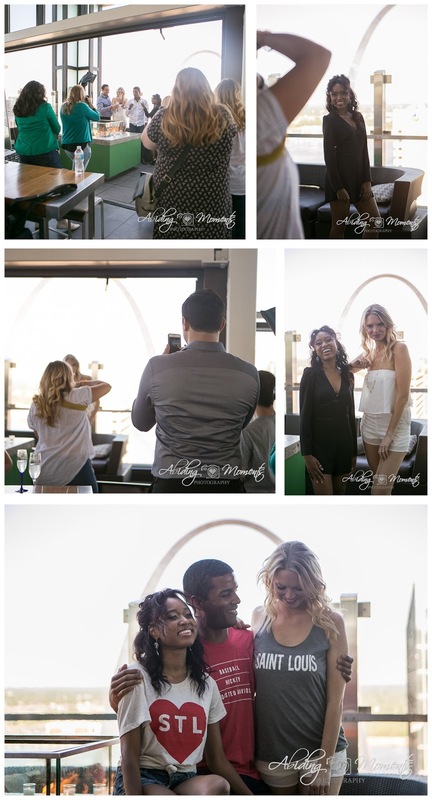 Awesome day clothing from Arch Apparel, beautiful dress items from Paperdolls Boutique, amazing models from Talent Plus, and a gorgeous view from a spot atop Three Sixty were all things that were set before our day even started! Once creatives arrived, it was time to get things prepped. 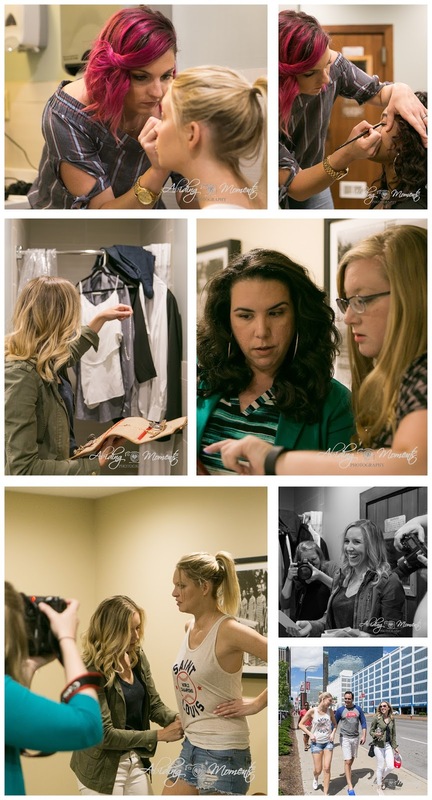 Hair and makeup is a big deal with a styled shoot, and Alissa did an awesome job of taking care of our girls. Beth's job as a stylist feels never ending while the shoot is going, making sure that accessories work well and the fit is just right. I loved this moment below when she shared a note with us from the owners of Paperdolls and several photographers gathered around to get a good shot! Details, details! 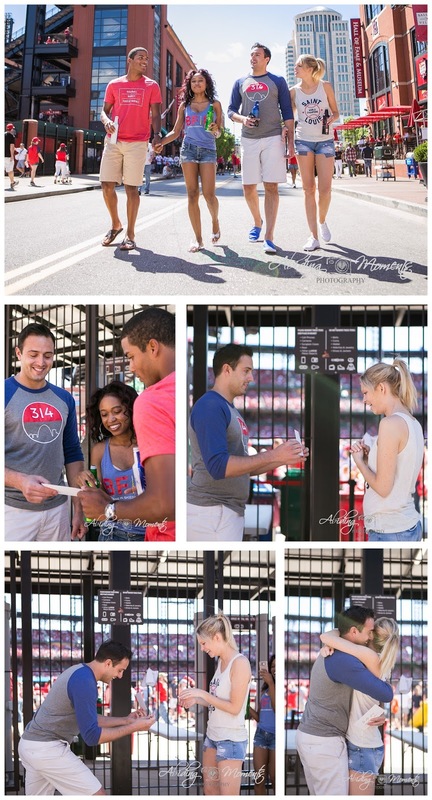 Once our models were ready, our group took off for Busch Stadium to get our first shots set up. Photographers hit the ground running and are looking for angles in lots of different situations. It's always neat to see how a group of different photographers will shoot the same scene and get awesomely different results. I have loved getting to know so many different creatives, and especially photographers, through this group. In the middle shots above are photographers David Jin and Cassy Benedict. They are both wonderful photographers and great folks to work with!! Below are Abby Willtrout in the top layer, and mixed in in the turquoise is the awesome Kelly Gordon, both working hard to get their own beautifully unique shots. In the shots above you'll find the fantastic Sarah Gibbs working her magic behind the lens and rocking her sweet style. And the hand-lettering on our proposal note below was written by the talented Dana Michelle. It's not all work for a styled event; we still have to have some fun and down time too. I loved the girls laughing during the models' wardrobe change and having a chance to rest. Deva Williams, our awesome cake artist, designed that scrumptious cake you see above. With a luscious filling, if you can imagine, it tastes even more fantastic than it looks. Our hard working crew in action! Lots of folks in the restaurant were curious to know what all the hubbub was about. It was fun to fill them in. 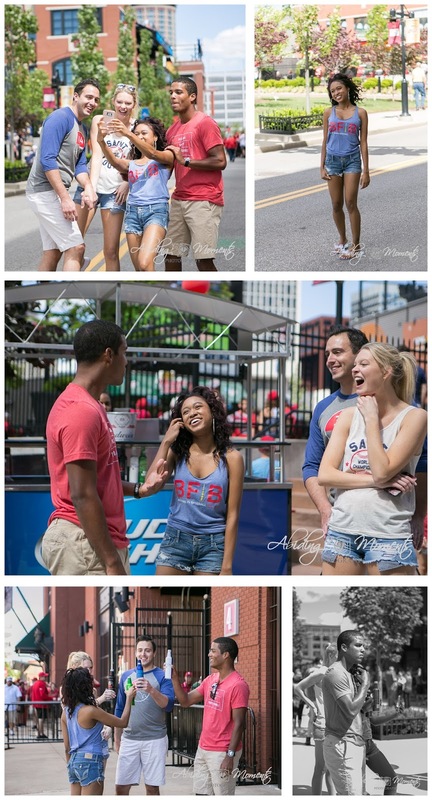 To end our shoot, we got a few last images of our models in their STL gear with the Arch in the background. 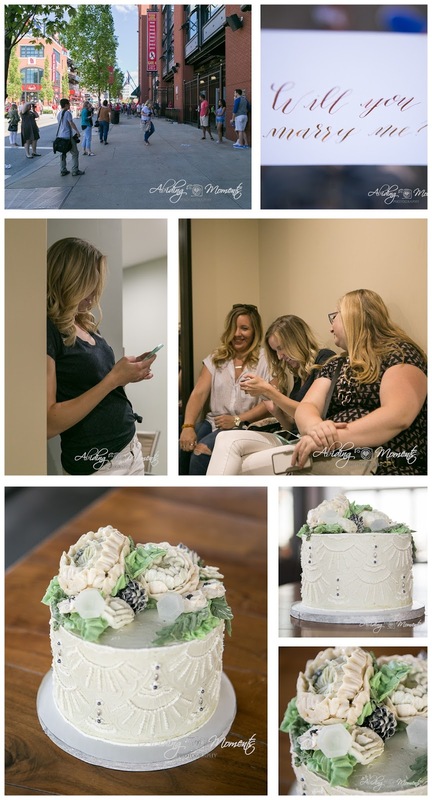 It was an amazing group of creatives and vendors that came together for an awesome styled shoot!! Ok, it's that time of year again. It's time to throw out everything you know of my style and play a little with me as a creative. I am a part of a creative group known nation wide at The Rising Tide Society. Their mission is quite simple: it is to support and encourage creative entrepreneurs through education and networking, #communityovercompetition. I have been a part of the group coming up on 2 years, and it has been just what this newbie needed to get the confidence and knowledge to get her little boat floating. Once a year, our local chapter teams together to create a collaborative event. In case you need a refresher, this was last year's. 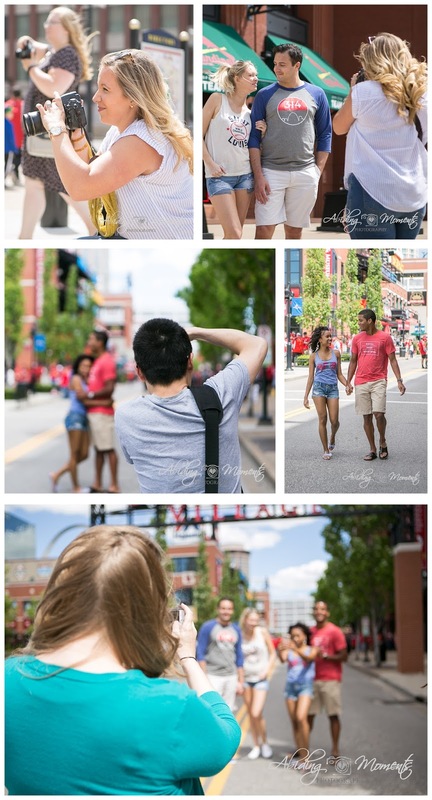 This year, there was a big desire to show off St. Louis for the amazing things we know and love about our city, so we decided to organize our shoot around an engagement that would take place downtown near Busch Stadium and Ballpark Village. I can't even begin to describe to you the amount of work that goes into a collaboration like this. Since styled shoots, while beautiful, don't really fall in line with my type of photography, I put more emphasis this year into shooting behind the scenes - be watching for a follow-up post to show you all those hard working creatives in action! As a photographer though, I can't see a lovely styled shoot unfold before my eyes and not participate, so for now, I am going to focus on the styled shoot. 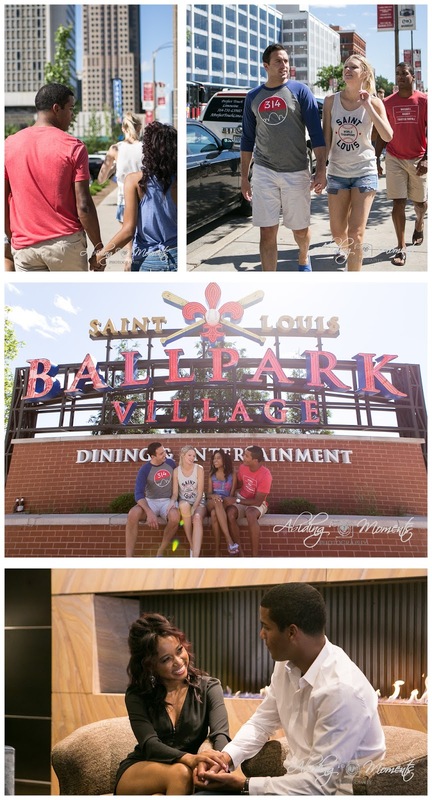 Our couples, 3 of the 4 professional models from Talent Plus, started with a walk to Ballpark Village, dressed in great clothing from Arch Apparel. If you are a sports fan, then you know the addition of Ballpark Village has been awesome for our city and screams St. Louis. It was the perfect backdrop to start our day. Our friends spent some time walking and laughing and just generally having fun. I mean, what says friendship + St. Louis more than sharing some local brews? 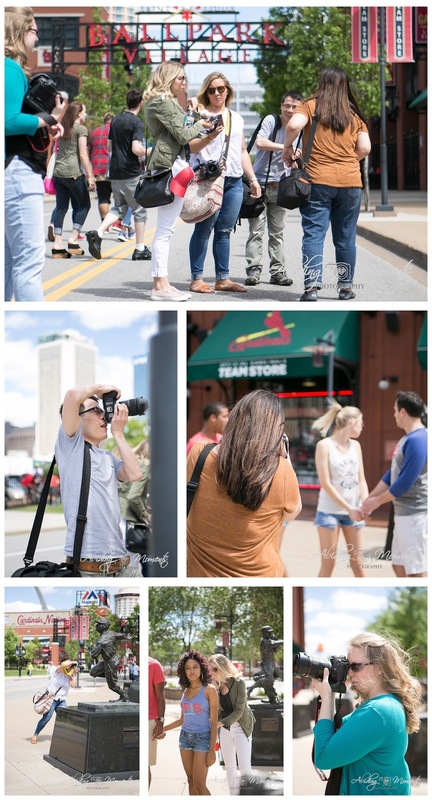 It was nice to see them enjoy a gorgeous day downtown amidst a city that was gathered to cheer on the home team. The engagement piece of our day was a ton of fun! The couple has been together for more than a few years, so it was fun to see them practice that reaction. And the onlookers even cheered for them!! 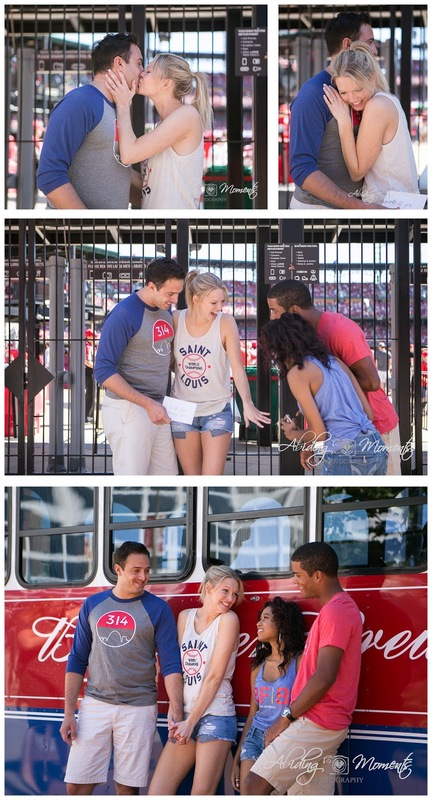 After the proposal, we made a quick stop at the Budweiser Trolley and headed back to The Ballpark Hilton to get ready for a romantic evening. A local restaurant, 360, partnered with us to help our couple have a private space to celebrate with their friends. And Paperdolls Boutique gave our girls some beautiful outfits to get dolled up in. I'm excited to be sharing my 5-on-5 story with everyone again this month! I have been doing this circle for almost two years and I have enjoyed all that has come out of this project. It forces me to sit and watch for true short stories in my everyday life. With a limit of 5 images to share, I have to be watching for something that will only take a few minutes to shoot, but still be able to have a start to end process. 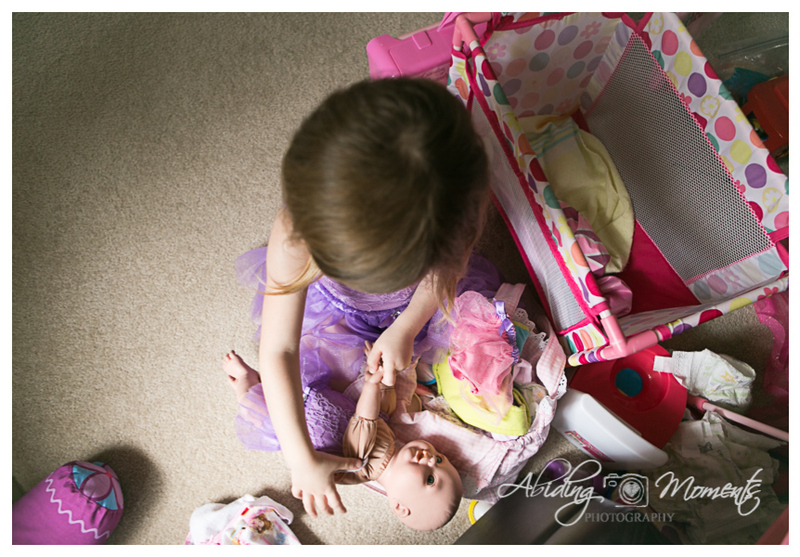 So, the other day, when Little Miss pulled out a matching doll and her dress that she had gotten at Christmas time, and asked if they could both wear them, I thought what a perfect time to shoot. I loved the process of watching her smoosh, I mean, dress, the doll. I was so glad that doll is flexible! 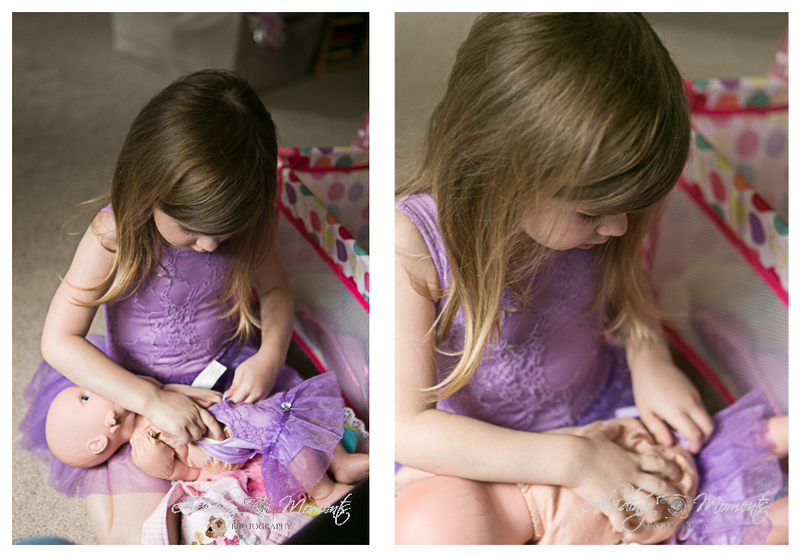 I also loved watching her little hands busy at work. She will only be "little" a short time longer. She is already growing up fast and I know it doesn't get any slower. This corner of our living room is the doll station, so when she plays, she is surrounded by all sorts of doll things. I love that corner. I love how it is overflowing with pieces of my own childhood and things that make playing with a doll and pretending to be a mom, real. And that smile. Oh that smile. 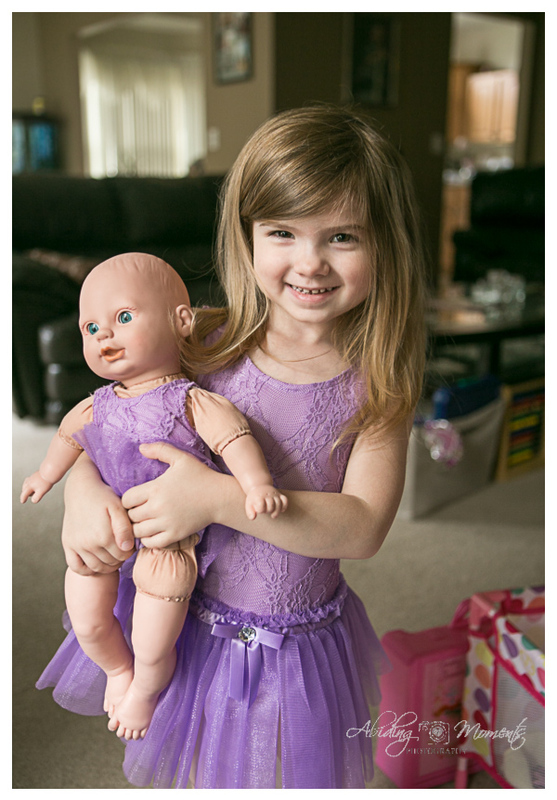 Side by side with her little doll and couldn't be happier to be "twins". And a lesson to the masses of, "take the shot before things change." In just a few short weeks, our girl's look has changed. Those long locks were in desperate need of a cut and are now close to her shoulders. 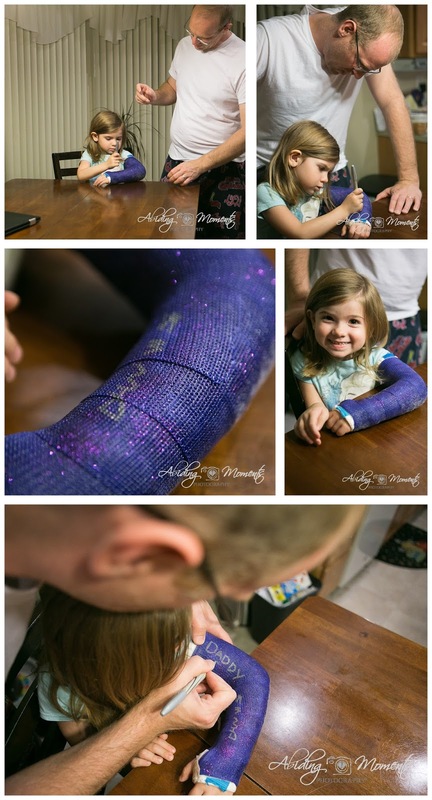 And last weekend, she fell and fractured her arm, now leaving her in a sparkly purple cast (be on the look out, because you know my camera went along). Ok, it's time to pass the baton! 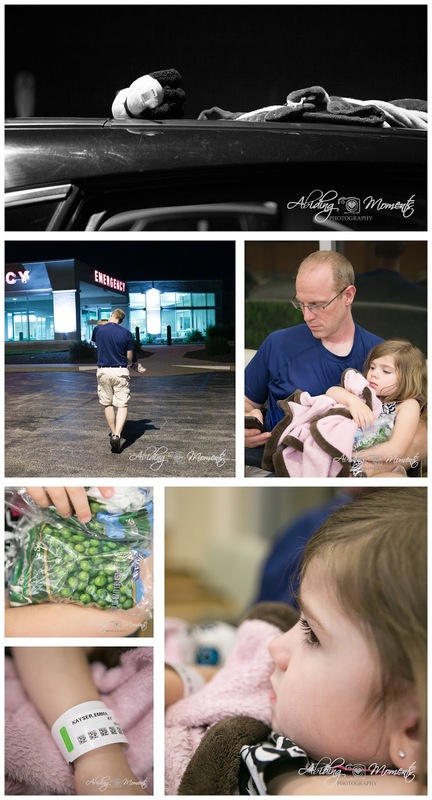 Up next in the circle is my talented friend, Stephanie Woodward, a Utah documentary family photography. Our group is excited about growing and having more stories to share with you, so we hope you love the bigger circle this month!! And don't forget that we photographers love to hear that our work spoke to you, so make sure to leave us likes and loves and comments if it did!